Cook lasagna noodles in a large pot of boiling salted water until al dente. Drain well. In a medium size saucepan over medium heat melt butter or margarine, stir in flour and let flour brown slightly. Stir in milk, stirring constantly until sauce thickens. Add the parmesan cheese to the sauce and stir well. In a 9x13 baking pan spread a thin layer of white sauce, followed by a layer of cooked lasagna noodles. 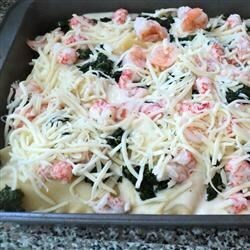 Place 1/4 of the shrimp, 1/4 of the crabmeat and 1 cup mozzarella cheese on top of the lasagna noodles. Repeat three times, making four layers. Top the final layer with sauce and remaining mozzarella cheese. Bake for 45 minutes or until top is brown. this is a nice lasagne if you're looking for something elegant. I added a layer of spinach, though, for color. Also, I wouldn't recommend baking the entire 45 min., that was way too long. Very tasty and easy to make. We substituted scallops for the crab because crab was too expensive this week. No-boil lasagna noodles worked fine. Will definitely make it again.